Stone Country Press: Mapping the forest, or mapping the mind? Mapping the forest, or mapping the mind? In that Empire, the craft of cartography attained such perfection that the map of a single province covered the space of an entire city, and the map of the empire itself an entire province. In the course of time, these extensive maps were found somehow wanting, and so the College of Cartographers evolved a map of the empire that was of the same scale as the empire and that coincided with it point for point. Less attentive to the study of cartography, succeeding generations came to judge a map of such magnitude cumbersome, and, not without irreverence, they abandoned it to the rigours of sun and rain. In the western deserts, tattered fragments of the map are still to be found, sheltering an occasional beast or beggar; in the whole nation, no other relic is left of the discipline of Geography. All maps are illusions, tricks of the mind, elaborate tapestries of scale. And they only exist in our head, despite their intricate keys and contours. Look at old political maps of the world, or Ptolemy's map of Scotland, or Timothy Pont's 'reformed' maps of the Scottish Highlands - they hint more at our imagination and preoccupations, rather than any 'physical' reality. Google maps are still just a satellite's myopic squintings, whatever their resolution. Anyway, being exact is impossible, fractals lead us into chaos, and by nature a 1:1 scale would be a ragged reality, as Borges suggests. Ptolemy's Map of Scotland, which way is up, what is north? Mapping for a book, providing a topographical 'bird's eye' overview, is already an imagining and a very personal interpretation. How do you reduce the world to a page? What is the optimum reduction you need? 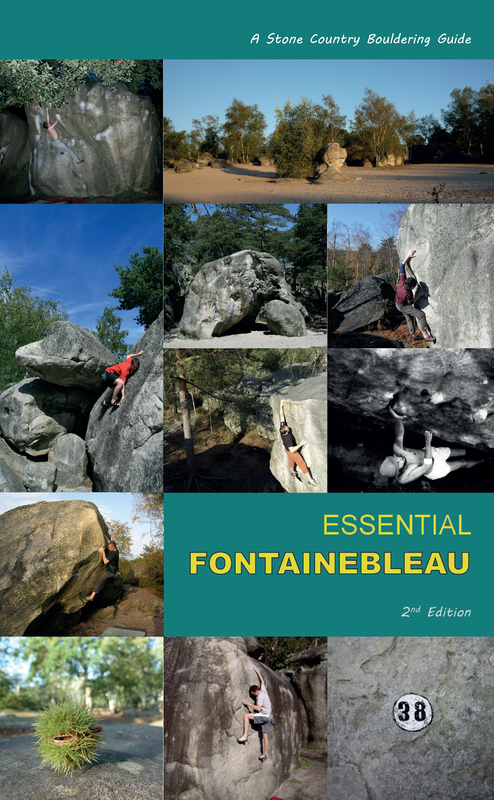 To map Fontainebleau for a guidebook on bouldering, I had to take my mental canary, intrepid little visionary high above my head, directing the wandering biped far below amongst the trees, clutching his sketchbook. Mapping the chaos of boulders meant long wanderings with the mental canary controlling my scratching pencil from on high . . . I was a human puppet in thrall to shapes of rock, stacked cubes - Jenga-towers of plinths and boulders. I marked on my little numbers, drew my squares and circles, interlocked my rhomboids, laid down my contours and began to grow the imagined map of my Fontainebleau. Just as Denecourt had done with his featured trails in the previous century. Year after year, with a sketchbook and the trusty canary, I set off into the oak and pines and birch, like so many before, but into my own imagination of the place. 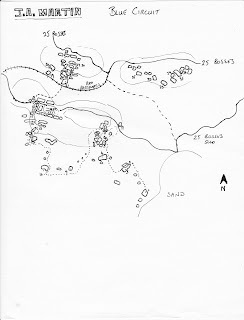 I couldn't map every stone and boulder problem, I had to imagine what would be useful for someone visiting the forest for a first time, what would help them navigate through a natural chaos. What was a landmark? What could be erased from relevance? What was remote; what accessible? Relativity is all, and thankfully Fontainebleau already has an in-situ mapping of colour-coded paths (thankyou, Claude-Francois Denecourt!) 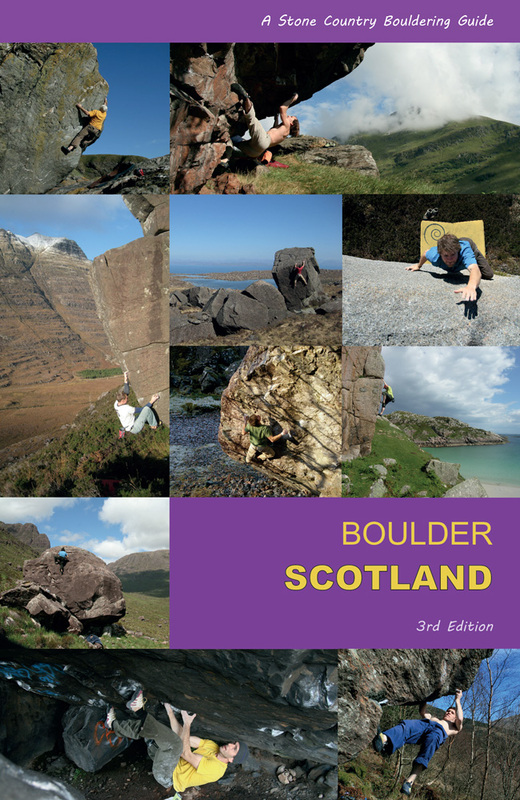 and a recent culture of painting numbered circuit problems on the boulders. My IGN map of Fontainebleau is ragged and holed in the creases from constant folding. I grew to love those little aluminium signs nailed to trees, stencilled with the old crossroads and bridleways of the forest - Chemin du Bois Rond, Chemin de la Vallee Close, Carrefour du Bas Breau . . . and so on, they all interconnected and gradually I encircled my empty spaces on the paper. Road maps I drew with to magnetic north, to avoid confusion between separate maps, but down at the micro-level, amongst the trees, north and south are meaningless, so each map can be orientated whichever way you like, you just need a frame of reference. 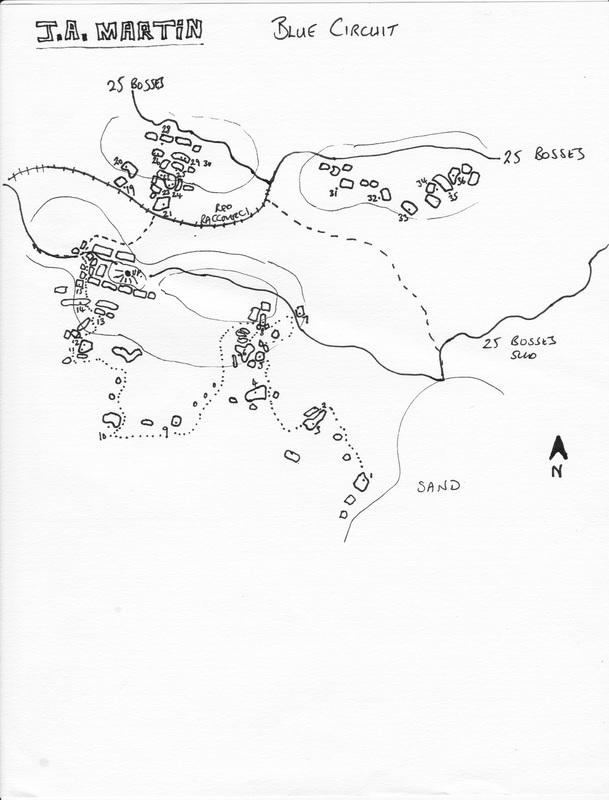 I stuck to the approach paths as frames of reference, marking the stones as I found them on the direction of approach, keeping the book page in line with the walking climber. Stomping into Potala, for example, the classic orange circuit appears at the base of the page as you suddenly emerge from the woods onto a sandy clearing and glowing, pristine ochre walls. I know that the blank page becomes the map . . . the blankness feels its way into meaning, this block narrows against this one, round the back should be red 22, follow the corridor, turn left, there it is, the canary wheels high above, re-orientates . . . the small figure far below, under the canopy, moves off again . 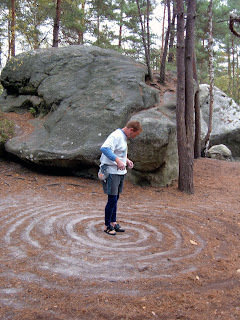 . . the forest landscapes of Fontainebleau appear like castles in a pop-up book of wizardry. Chasing the right weather . . .